The Friends of the Elm Grove Library group had a mission – create an updated and uplifting new identity for the “kid’s space” area of the Elm Grove Library. The space has the desired “wow factor” – new architectural finishes, including vibrant saturated paint colors for the walls, new carpet that was laid in a pattern of bold, overlapping large-scale graphic shapes in matching colors, a new cloud ceiling mural and whimsical decorative lighting, new custom millwork to create storage and display for reading materials and toys, and a new swing-out, wall-attached custom puppet theatre that creates a new play space for children to use the library’s puppet collection. All elements combine to create a special place, just for kids. The new furniture layout re-used the existing library shelving, but re-configured and re-located it to open up a space for a new Reading Lounge, filled with comfortable and colorful new furniture, perfect for curling up with a good book. New graphic artwork on the walls, including a large custom vinyl appliqué mural featuring a quote from Dr. Seuss, helps to create the desired sense of arrival. 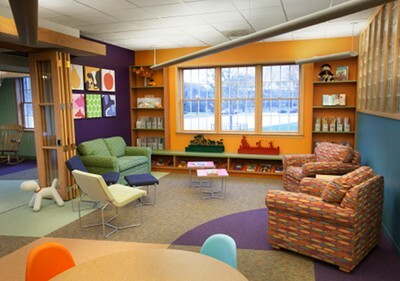 Creative worked within the budget of the Friends of the Elm Grove Library to design, build and furnish a new Children’s Library Area that met all of their criteria for an updated, fun and functional space. The Friends group and the larger Elm Grove community have deemed the project a resounding success with an enthusiastic and positive response and increased usage of the Children’s Library area.